This route is probably the best route in the popular Pony Express Area of the West Ridge of Eldo. It may be one of the best shorter routes in Eldo. P1) 5.9, 80'. Climb the left most of the cracks in a large inset, starting just below a pine tree and ending at a pine at the base of a right-facing dihedral. Most of the gear is thin-to-fat finger sized. P2) 5.11, 55'. From there, climb up the dihedral until it gets bare, then launch up and left though a series strenuous thin moves (11b/c) to get to the arete on the left, and up to a jug on the face and then back right to the corner (awkward). The gear is pretty reasonable and frequently fixed (small stoppers). There is one hard move (11a, balancy) remaining once you are back to the corner. What will be the crux for you depends upon your individual strengths and weaknesses. Going directly up the corner the whole way is thin stemming (5.11d) and is not as well protected. To descend, rap to the rings above Iron Horse and then rap again to the ground. The protection is reasonable at all times, but not necessarily great. The crux pro is several small nuts in a row, so take some small gear. There is most frequently fixed protection at the crux, but it can be transient and would best be backed up. [Hide Photo] Rob about to have at it. [Hide Photo] The fun stuff. Photo by the talented Ben Walburn. [Hide Photo] April leading up the first pitch of Pony Express. [Hide Photo] An unknown climber follows 'Pony Express (5.11)' on Eldo's West Ridge. Photo by Tony Bubb, 2003. [Hide Photo] Leading second pitch around 1989. [Hide Photo] Zack gettin' after it on Pony Express. [Hide Photo] Routes in the Pony Express area. Pony Express takes the leftmost crack line above two trees and jogs right to a 2-bolt anchor. The second pitch continues up the dihedral above. [Hide Photo] Lost my mind. [Hide Photo] Lisa starting up P2 of Pony Express. [Hide Photo] The exquisite 1st pitch. [Hide Photo] Josh Janes past the arete and back to stemming on 'Pony Express (11c)', on Eldo's West Ridge. Photo by Tony Bubb, 2005. [Hide Photo] Lisa hitting the arete on Pony Express. [Hide Comment] I attempted to lead the second pitch of this climb today, and it appears that the wasps are back. I didn't see a nest, but there were quite a few wasps flying in and out of the crack (on the face) for its entire length, and more lurking in the initial finger jams. [Hide Comment] Onsight Baby! I messed with some gear at the big hold halfway up and after fiddling for a few seconds thought "F*#@ it I have a bucket" and kept climbing. 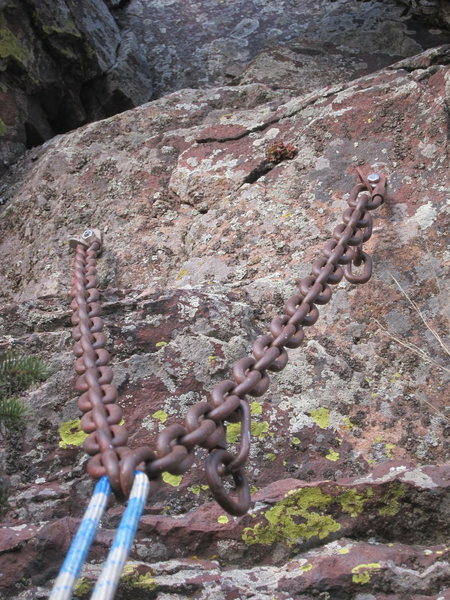 [Hide Comment] Route update: new righthand anchor bolt and new chain on P2 of Pony Express. We made it so that you can equalize your rope in two directions: either rap straight down to the ground from the lowest chain links (80m rope required?) or rap the Pony Express corner to the P1 anchor by using the quicklinks on the right chain. New righthand anchor bolt and new chain. Notice the quicklink and ring on the right chain allowing you to equalize rappeling down the Pony Express corner.